Indian doctors have successfully treated first case of Amniotic Band Syndrome using Regenerative Medicine and cell-based technology in Mumbai .Amniotic Band Syndrome (ABS) is a group of congenital malformations, which occur due to an early rupture of the amniotic sac. According to recent epidemiologic data, the occurrence of ABS is around 1 in 1,200–15,000 live births and it exhibits no special preference for a specific gender or race, however, some studies report a slight preference for Afro-Caribbean individuals. The pathogenesis of the ABS has not been totally elucidated, but it probably has a genetic origin. 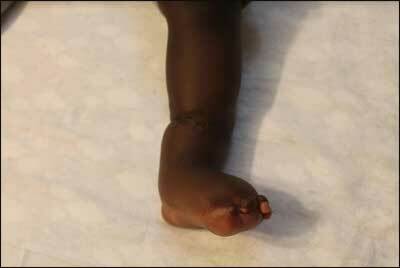 Since birth, 15 months old Baby Zinnia Munthali from Zambia was experiencing occasional swelling and itching of left lower leg and the fingers in her right hand had flesh overgrowth. 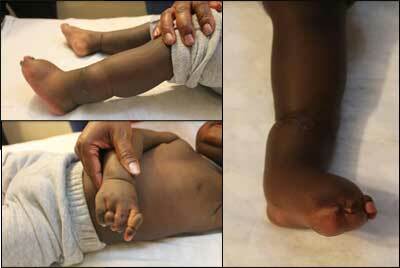 It gave an appearance of deformity although she was a known case of Amniotic Band Syndrome. She has normal developmental milestones; one of her maternal cousin also faced similar syndrome. At 7 weeks of age, Zinnia underwent 1st corrective surgery and another at 5th months of age to remove the fibrotic bands in her limbs. However, there was no improvement in appearance of the bands or in symptoms. Later, when her parents heard about Cellular Therapy in India, they decided to come to India for treatment. Zinnia underwent three sessions of autologous cell based therapy with platelet rich plasma injected locally into the affected areas. Refashioning of excess mass of index finger and ring finger was also done. On her leg, scaffold technology was used to provide extracellular matrix support to the administered cells. Oxygen therapy was advised as an adjunct to cell and scaffold based therapies, in order to achieve adequate tissue oxygenation and enhance healing. Zinnia is undergoing regular physiotherapy rehabilitation as well. Within a month, the fibrotic bands are less visible. 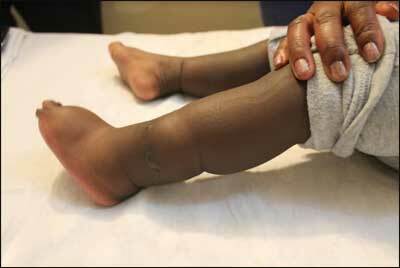 Zinnia’s leg movements are free and no swelling is observed. Itching has reduced considerably. ABS may occur due to the rupture of the amnion during early pregnancy. The fetus’ arms and legs, tangled around the amniotic bands, may be amputated during intrauterine development due to loss of blood flow. The variability in the type and severity of the anomalies caused by this syndrome can be attributed to the stage at which the amniotic membranes rupture. Diagnosis of ABS is usually missed and there are no treatments. Corrective surgeries are very difficult and do not give desired results. Baby Zinnia is rare case and is under treatment using Regenerative Medicine and cell-based technology”, says Dr. Pradeep Mahajan, Regenerative Medicine Researcher, Mumbai. Cell-based therapy is proving to be promising even in rare conditions. The reason for this is the inherent healing ability of our body cells and tissues. Zinnia being a young child has benefited from the therapy quite fast. She will require maintenance dose therapy after further evaluation to ensure complete healing of the fibroid bands and achieve optimum functional and cosmetic results”, concludes Dr.Pradeep Mahajan.